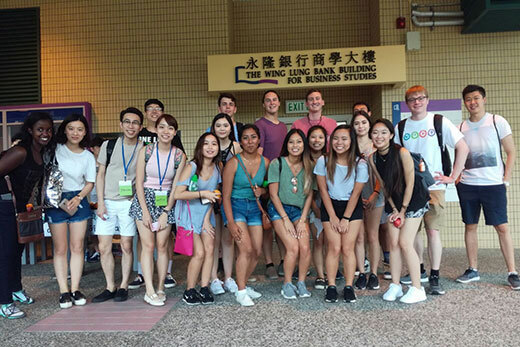 Four Emory undergraduates pose with their cohort of academic interns this summer in Hong Kong. The Emory students are Victoria Umutoni (front row, first from left), Grant Barker (back row, third from left), Neil Kumar (back row, fourth from left) and Shuxin Chen (front row, fifth from left). Photo provided. Rising Emory College junior major Reilly Dugery kicks off the discussion of office culture by confessing her bafflement that supervisors don’t see email as the formal communication she does. Another rising junior, Nisaa Maragh, notes workers stand out in her office when they dress professionally, since casual is the order of the day. Linguistics professor Susan Tamasi lets other students chime in before she explains office hierarchy and generational difference as cultural components in the work world. She ends the day’s Intercultural Discourse class by telling her students to continue their ethnography as a way to hone the skills needed to navigate that world. Then Tamasi gets back to work in her Emory office, as Dugery does the same in a Dublin coffee shop and Maragh returns to her Toronto job. Welcome to the academic portion of Emory’s Global Internship Program, which places 30 undergraduates with companies worldwide and serves as a model of how Emory conducts online classes. Emory first developed its online program about four years ago as part of a broader consortium of institutions, says Sally Gouzoules, associate dean for International and Summer Programs. From the beginning, the main concern was that the classes could become large and impersonal self-paced offerings that didn’t maintain Emory’s high standards. The solution was to cap courses to 20 students and require a synchronous component in which students and the professor meet online for the discussion that would be typical in on-campus classes. The Global Internships program, for instance, requires weekly 90-minute synchronous sessions. After spending her first and second years at Emory on the university's smaller Oxford College campus, Maragh is accustomed to engaging and being known in her classrooms. The marketing major at Goizueta Business School, who is double majoring in religion, shared in a recent synchronous session that she had found she’s more productive in the casual environment at her internship with Toronto social enterprise CitizenRad, a fundraising retail platform. But just as important as her experiences were hearing the ones classmates were having thousands of miles away. Faculty must be strategic in how they deploy their course material during synchronous sessions to encourage that kind of discussion, says Sara Jackson Wade, who oversees summer online courses for Emory College in the Office of International and Summer Programs (OISP). It is a yearlong process for professors to work with Wade and the College’s online team, developing their curriculum to make sure the signature residential component of Emory’s undergraduate experience remains intact online. Emory built on a university consortium project to craft its own pilot program two years ago, with six courses and synchronous lectures from Emory faculty. The OISP launched Emory’s own program last summer, with 250 students enrolled in 16 classes. That grew 90 percent this summer, to 475 students in 32 courses and sections. An introductory biology class, for instance, has two completely full online sessions. If anything, Wade says, the online courses are more rigorous than classroom work. Professors can send direct messages to students during synchronous sessions and also split classes into online “rooms” that the professor or teaching assistant can pop in and out of during discussions. "Part of the reason it works so well in the summer is Emory students want to continue to work on their studies even as they pursue other opportunities such as internships and jobs,” Wade says, adding the program is open to all Emory undergraduates, regardless of whether they spent their summer at home, on vacation or working in internships. Global Internships, which grew out of a hybrid structure of online and study abroad program development, is ideal for online learning, says Dana Tottenham, who directs the program. The signature program — which plans to double to 10 cities next year from its current offering in Boston, Dublin, Hong Kong, Singapore and Toronto — demonstrates how a liberal arts education can translate into the workplace. The linguistics course is ideal for the experience, but given demand for repeat internships, Tottenham says a second online course may be developed to create deeper connections with Emory’s liberal arts curriculum. Keeping connected to Emory can also help when work life can be somewhat isolating, such as Dugery’s internship shadowing the Guardian newspaper’s Belfast correspondent, Henry McDonald. There is no office to speak of, so the English and history double major grabs Wi-Fi where she can as she tackles assignments. Her work with McDonald, such as helping to cover the UK parliamentary election, often involves minimal day-to-day oversight. Tamasi is enjoying her first foray into Emory’s online learning as well. Many of the students had no previous office experience, so they are learning new things at work that they bring to her synchronous sessions. And each session, she says, helps her illustrate how students’ professional, educational and cultural educations will merge once they graduate.